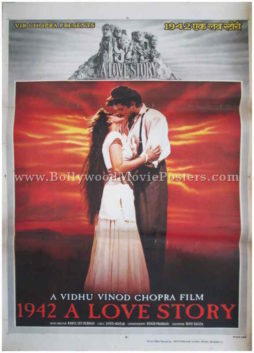 Classic Bollywood movie poster of the blockbuster Hindi film Bombay (1995) for sale. 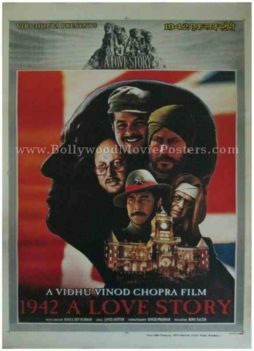 Featured here for sale is an original Bollywood poster of the 1995 cult hit Bombay, which was directed by Mani Ratnam and starred Arvind Swamy and Manisha Koirala in lead roles. Originally released in Tamil, Bombay was also dubbed in Hindi and Telugu. The phenomenal success of the film made it the most acclaimed Tamil film of the 1990s, with its Hindi dubbed version breaking records for box office collections. The film was a massive commercial as well as critical success and was screened at several international film festivals (including the Philadelphia Film Festival in 1996). Bombay became one of the highest grossing films of the Chennai film industry upon its release. The film bagged numerous awards such at the annual National Film Awards and Filmfare Awards, besides clinching several international awards as well such as the 1995 Edinburgh International Film Festival (Scotland) award and the 2003 Jerusalem Film Festival (Israel) award. Music for the film was composed by A. R. Rahman, who bagged his fourth consecutive Filmfare Best Music Director Award for his brilliant soundtrack that sold over 15 million units. Songs from the film, most notably tracks like “Hamma Hamma,” “Kehna Hi Kya” and “Tu Hi Re” are fondly played and remembered till today. 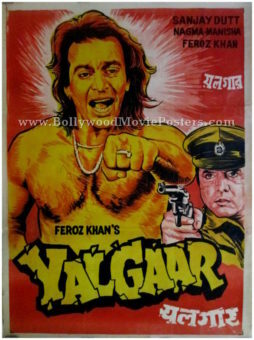 Bombay is ranked among the top 20 Indian films in the British Film Institute’s rankings, making this classic Bollywood poster highly collectible! Printed and circulated during the initial release run of the film (late 1990s), this hand painted Bombay poster was originally designed for publicity of the film but never ended up being used. 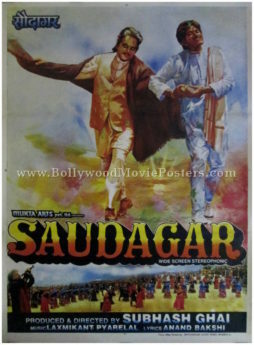 This old Bombay movie poster features stunning hand painted artwork and was designed originally in oil on canvas format. 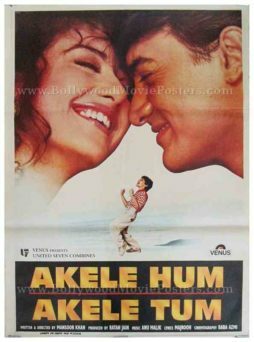 A large hand painted close up of Manisha Koirala is seen on the left of this Bombay film poster in white. Arvind Swamy is seen on the right in a brilliant hand painted rendition. 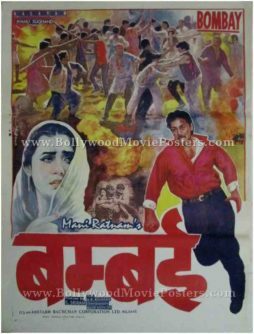 The top of this Bombay poster features an action packed riot scene, essential to the plot of the film. 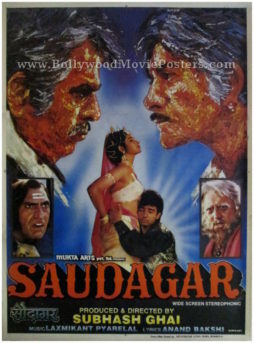 The theme of the film caused considerable controversy due to its depiction of inter-caste relationships and religious riots. As such, the film was banned in Singapore and Malaysia upon release. Such was the historical impact of the film that a book was written on it by author Lalitha Gopalan, which was published by BFI Modern Classics in 2005.